A Comparison between Commedia Dell' Arte and Trestle Commedia and Trestle are both mask performance companies each with its own mask rules and styles. 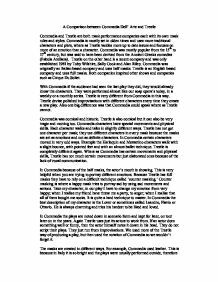 Commedia is mostly set in olden times and uses more traditional characters and plots, where as Trestle tackles more up to date issues and focuses on more of an emotion than a character. Commedia was mostly popular from the 15th to 17th century, but was said to have been derived from the Ancient Greeks comedies (Fabula Arellana). Trestle on the other hand is a recent company and was only established 1981 by Toby Wilshire, Sally Cook and Alan Riley. Commedia was originally an Italian based company and uses half masks. ...read more. Trestle has not got one character per mask; they use different characters in every mask because the masks are set as emotions and not as definite characters. In Commedia certain characters moved in very odd ways. Example the Harlequin and Mezzetino characters walk with a slight bounce, with pointed feet and with an almost ballet technique. Trestle is completely different again. Where as Commedia has certain movements and physical skills, Trestle has not much certain movements but just elaborated ones because of the lack of vocal communication. In Commedia because of the half masks, the actor's mouth is showing. This is very helpful when you are trying to portray different emotions. ...read more. They do not script their plays. They just run from improvisations. 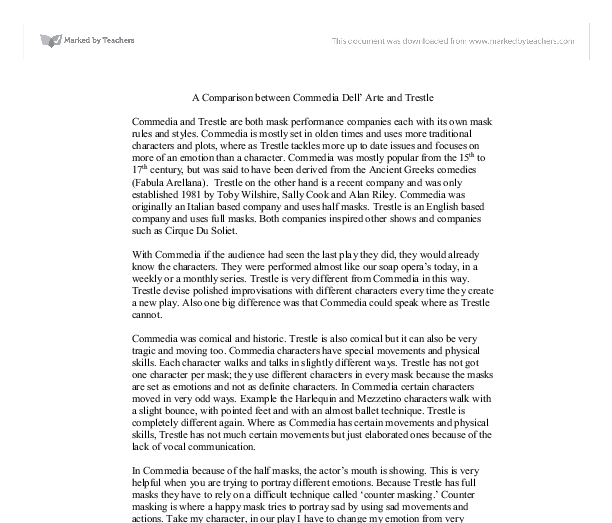 We used more of the Trestle way of producing a play, but then used the notation of Commedia so we wouldn't forget it. The masks are created in different ways. For example, Commedia used leather. This is because in Italy it is so bright and the plays were usually performed outside, therefore using leather eliminates glare to the audience. A disadvantage of this is the heat inside the mask. It could sometimes become really unbearable. Trestle uses plastic. This is because it projects on stage better than most materials. This also keeps heat in and sometimes becomes a problem. Trestle and Commedia both use masks and are both theatre companies, but I hope you can see that obviously they are completely different in many aspects. By Joseph Connor ...read more. Yet his character seems deprived of a social life and the 'cool' elements. An example of this is when Lyle (Seth Green) and Handsome Rob (Jason Statham) are going after a van and uniform for the unsuspected infiltration into the enemy's home.